Merry Christmas, folks! This week I thought I’d review how some dentists take advantage of the dental practice marketing opportunities presented by the holiday season. Holiday Shopping… At the Dentist’s Office?!? Zoom tooth whitening treatment is a part of each “pamper-me” package, but that’s not all. Recipients also get gift certificates for massages and facials. It’s a great way to make a profit off of today’s spa dentistry trends! Secret Holiday Marketing Weapon: Christmas Lights! How much money does a single new patient bring in? I figure that the average net contribution to the bottom line for an additional new patient, after all the costs of delivering the dentistry, is going to be at least $500, and quite possibly much more. By this math, you would only need six new patients to pay for this the first year and just two additional new patients in succeeding years. One IDA dentist has been working hard to use the marketing know-how he’s picked up from The Wealthy Dentist to pick up new patients and increase name recognition of his practice. Dr. Jeff Clay of Shady Spring, West Virginia, teamed up with a local radio station to offer a holiday dental giveaway. By now it’s a little late for you to launch a Christmas marketing campaign – but not to worry, New Year’s is right around the corner! 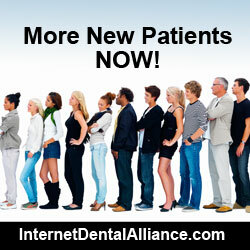 You can bet that lots of patients will be resolving to finally get the dental treatment they need. Plus, it’s a great time to market yourself to insurance patients whose benefits are renewed with the new year.